I-League: Aizawl FC & NEROCA play out goalless draw in 2nd Northeast Derby! Home / Indian Football / I-League / I-League: Aizawl FC & NEROCA play out goalless draw in 2nd Northeast Derby! 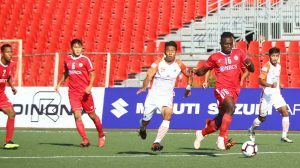 The second Northeast derby of the 12th I-League played between Aizawl FC and NEROCA FC at the Rajiv Gandhi stadium in Aizawl ended in a goalless draw. Both teams had their chances in a game where hosts Aizawl FC had a slightly better of exchanges, but a goal eluded them throughout the 90 minutes. Both Aizawl FC and NEROCA now have two points from three games and remain on the bottom rungs of the standings. The second half saw more end-to-end football and was clearly more entertaining but both Gurpreet in the Aizawl FC goal and the NEROCA custodian Maouro Boerchio managed to return their first clean sheets of the I-League campaign. Both the coaches, Gift Raikhan of Aizawl FC and Spaniard Manuel Fraile of NEROCA go away from the game with their worries around their strikers not converting chances. Gift, coaching for the first time against his previous side, chose to field an unchanged eleven from the previous game against Mohun Bagan. Fraile meanwhile effected four changes into the eleven which started the last game against Gokulam Kerala FC. NEROCA’s Singham Subash Singh lost his place and so did Denechandra Meitei and Tondonba Singh. They were replaced by Biaklian Paite, Sebastian and Jerry Onesemas. The fourth however was forced and a blow of sorts for the visitors as dependable centre-back Eduardo Ferreira of Brazil who had scored against Gokulam Kerala FC got injured during the warm-up and had to be replaced by Under-22 Abdul Salam. Nigerian defender Kareem Nurain of Aizawl FC had two close shaves through two free kicks. In the 23rd minute, Aizawl FC’s third corner of the game saw NEROCA defender Sebastian make a hash of his attempted clearance and the ball fell to Alfred Jaryan whose powerful volley from just outside the keeper’s area was well saved by Boerchio. Aizawl FC came back into the game with the introduction of Ivorian Zikahi Dodoz in place of Lalrinfela. However, the home team’s Liberian striker Ansumanah Kromah was guilty of many a missed opportunity including being caught off-side, at times inexplicably, as many as four times. Aizawl FC will now play host to defending champions Minerva Punjab FC on November 10 and NEROCA will travel to Srinagar to challenge Real Kashmir FC on the next day. Previous Engrossing Bordoloi Trophy final on the Cards! Next VIDEO – India Today TV: I-League makes its Kashmir debut through Real Kashmir FC!